Although I don’t have water on my doorstep, or to be more accurate, within walking distance, I do have a reasonable amount to go at in the wider area. I have much to thank the industrial revolution for on that front, as the Black Country has miles and miles of canal network. Oh and by the way, as I’m sure you realise, the Black Country is so named due to its industrial heritage. With furnaces, pits and industry, it really was a dirty place. I had a political activist on YouTube accusing me of racism because I talked about the Black Country. They thought I was using the term because of the number of black people who live there. I quietly deleted their comment to save them further embarrassment. It’s good to check facts before speaking out on things, especially in this day and age when we can research via the Internet. By the way, the rant didn’t bother me, I actually thought it was funny. Anyway, I kicked this week off by visiting a section of Black Country canal I am well familiar with. 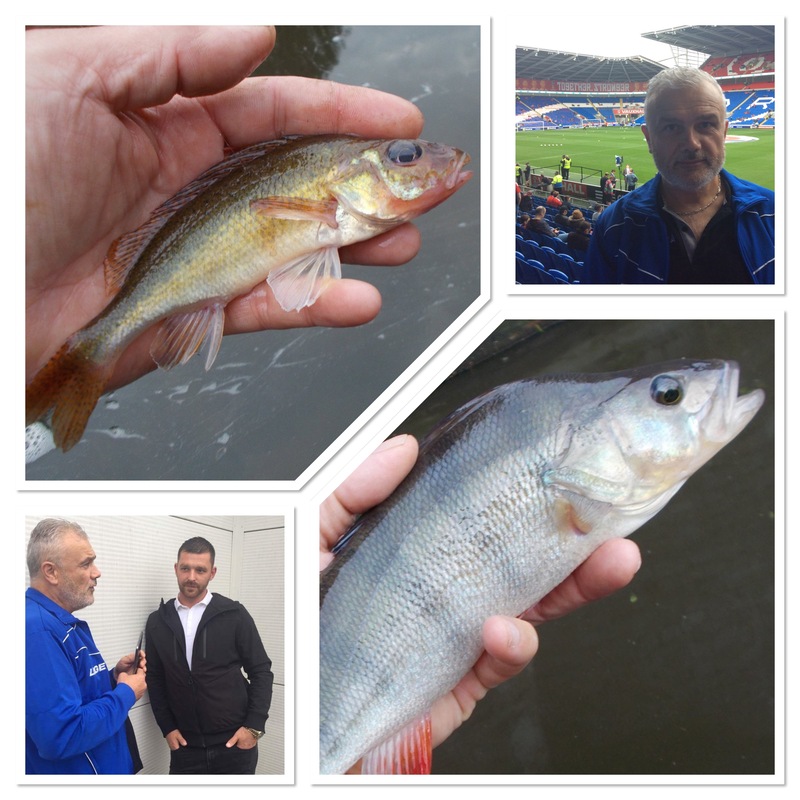 Another short session, it was very fruitful as I caught mostly perch but also a chub and ruffe, with the latter quite decent. I’ve now located a number of spots on the local canal network where I catch a few good fish. I love them, I think they’re great. Session two was back on my secret brook. I fished with five maggots on a size 10 hook and caught roach. As the fish haven’t been targeted before, they’re not shy. I even kept my 6lb perch-fishing line on the reel. Maybe I’ll have to scale down in the future, but not for now. My weekly blog entries at the moment pretty much consist of fishing and football, and it was the latter that I turned my attention to with a visit to AFC Wulfrunians, as they hosted Walsall Wood FC. It was a good game, the best non-league match I’ve seen so far this season. There was some good football played and was number 24 on my quest to attend 100 fixtures this season. That became a quarter of a century the next day, as I travelled across the border into the Welsh Premier League. With TNS off to a flying start this season, that continued as we winged our way to Airbus UK. In spite of going a goal down in the first half, a spirited performance after the break ensured that it ended a comfortable 4-1. After the game I interviewed manager Craig Harrison and two-goal hero, Alex Darlington. The interviews not only go out on TNS TV, which is the club’s YouTube channel but they also get picked up by other media sources as well. The next day travelling to Cardiff (more of that in a moment), with the radio on in the car, BBC Shropshire played some of the Darlo chat in their sports broadcast. My third game in as many days was at the Cardiff City Stadium, as Wales hosted Moldova in a World Cup qualifier. I only had the opportunity the day before, and armed with complimentary tickets (it’s not what you know, but who), I set off with Sam Thomas and my wife, Debby. The TNS Radio tech wizard and the TNS Radio cake-maker, it was very much in-house as we made our way to the capital of Wales. We had a fourth ticket and that was taken by Scott James, the Caerau Ely goalkeeper. I first met Scott when he was at Haverfordwest West in the Welsh Premier League and it was great that he could join us. I took full advantage of the situation by doing an interview for the TNS Radio Football show, otherwise known as our weekly podcast. At Cardiff City and Newport County in his younger days, Scott represented Wales at U-17 level. Well, if the company at the game was brilliant, the match itself was out of this world. I thoroughly enjoyed it, as indeed did my wife, Mrs B, although I think the B stands for Bale from now on. He is a brilliant player though, truly world-class, and he had a great game. The singing of the national anthem (above) was really touching. Although I am English-born I do have distant Welsh heritage and I’m actually very proud of that. That’s why being involved in Welsh football has magic as far as I’m concerned. In the dying seconds of the match I decided to go on Facebook Live (above) and the timing for that was perfect as Wales had, and converted, a penalty with the last kick of the game. You can see that footage above and, if you’re a regular reader of the blog you will notice that there’s no main video this week. Instead I’ve included stuff from my social media accounts. It’s just an experiment to see how it goes. By the way, as far as facebook is concerned, feel free to send me a friend request. Some people keep theirs private and just for family or close personal friends but I’m happy to add anyone. I use mine as a way of communicating with the world, so why not come and be part of my universe. Along with Twitter, it’s my social media connection with the internet. A lot of people knock these things, all I say is if you don’t like them, don’t do them. They work for me. From the Wales national team it was back to the champions on Wednesday as I attended a marketing strategy meeting at the club. It went very well and I’m looking forward to getting involved with the new ideas that we talked bout. I enjoy media work and the video above, by the way, is another Facebook Live presentation and if you are reading this before the Sunday, why not have a go and give me a prediction? After the meeting at TNS my plan was to do some other stuff at the club, then home and get some fishing in. However, as time pushed on, instead I decided to head for Flintshire for the Welsh League Cup game at Holywell Town. I enjoyed it very much, of course, but with another fish-less day I was determined to get out bank-side for my final outing of the week. As you can see from the Facebook post below, it was another long day but I’m not complaining, far from it. A cut above the rest. An evening on the canal.